At last, ahead of the beta, here are Fallout 76's system requirements. 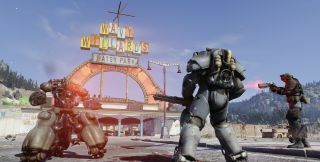 Fallout 76's system requirements have been announced by Bethesda ahead of next week's beta on PC. Today, the publisher added them to the game's FAQ page, but rather than scrolling through all of that, we've captured them for you right here. It's probably no surprise that the system requirements for Fallout 76 are slightly more demanding than Fallout 4 was. Indeed, the minimum specs here are roughly similar to the recommended specs for 2015's 3D Fallout game. The beta begins next week on PC, but we've been playing the Xbox One early beta, and Chris wrote a little bit about his adventures hunting down outlaws here. I, meanwhile, climbed up to a bridge and played the banjo, then went to bed, because the beta started at the slightly ludicrous time of midnight in the UK. Look out for further fun pieces about the game over the coming weeks. Correction: we previously listed the minimum spec Intel processor as an Intel Core i7 4790 3.6 GHz. This has since been updated to an Intel Core i5-6600k 3.5 GHz.